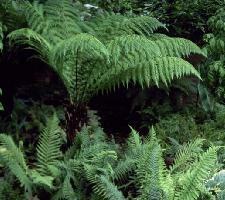 Links Page, Ferns-Country-Lincolnshire-Nurseries and more. Ferns for waterside and wet places. Despite the common misconception to the contrary, only some ferns are suited to growing in wet places and bog gardens. However these below are some of the best, which we recommend. Dryopteris cristata. Crested Buckler Fern, British native, fleshy pinnate-pinnatifid leaves, needs a moist acid soil not easy, but impresses where it is grown. 60cm. Dryopteris sieboldiae. Very unusual with broad leathery pinnate fronds and one long pointed pinna at the end of the frond, quite unlike any other Dryopteris, but not really hardy, may be worth trying in sheltered areas, likes moisture. Equisetum varigata. The Variegated Horsetail. Good plant for the water side, like a fine evergreen rush, with black and white nodes along each stem. Despite being a Horsetail it is not something to be frightened of, as it spreads slowly and is shallow rooted so easy to remove if necessary. Though it likes moisture it will grow in ordinary garden soil but is not as tall. 60cm+. Equisetum scirpoides. Dwarf Horse Tail. Easy spreading plant, which forms cushion like clumps. There is a twisted leaved form which looks somewhat like the Corkscrew Rush. 30cm. The Osmundas. 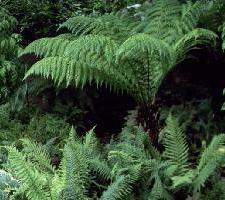 Are a small genera of ferns related to some of the earliest ferns to have evolved. They are generally large plants which like moist acid soils. The main character of the Osmunda is that the sporing bodies are carried on separate pinna which are often different from the rest of the frond which is quite a striking and often colourful feature. Osmunda regalis. Royal Fern. Perhaps our biggest British native, slow growing to 150cm+ and with a liking for a a moist/wet soil. O. regalis is always impressive and has an air of strength and masculinity, perhaps because the fronds though large, are of simple bipinnate construction with large smooth pinnules, much like giant Ash leaves. The fertile fronds come up in the centre of the plant, with the fertile pinna on the tips, looking like the seed heads of Docks or Astibes, which may have obtained for Osmunda the alternate, and completely inaccurate, name of flowering fern. It is much less common in the wild today than it used to be, but is still widely distributed, and I have seen two metre high thickets of it in deep wet valleys on the North Yorkshire Moors, and also plants an eighth that size growing on the cliff faces of Lundy island. It is widely thought to be intolerant of lime, but since it grows vigorously in my own garden this plainly is not true. There is a highly variable, purple stemmed form called ‘Purpurascens’, which some consider to be a subspecies. And also crested and crisped forms, which can be hard to find in the trade. Osmunda claytoniana. The Interrupted Fern. Is a rather beautiful foreign species, of much softer appearance than O. regalis, and only about two thirds of the size, A good fern for a moist spot. It has its fertile pinna in the middle of the frond, hence the name Interrupted Fern. Pillularia globulifera, The Pillwort. A curiosity really, the Pillwort is a rare native fern which grows on the bottom of ponds and looks like a grass lawn just three inches high, so not a great garden plant, and difficult to keep going if you try it. But it is sometimes grown in aquariums as one of the few plants that will give a lawn like structure. However the real interest in Pillularia is in its survival strategy, which is that when the water in which it lives dries out Pillwort looses its fronds entirely, and leaves behind on the dry mud just its sporing bodies which look like the old fashioned small round apothecaries pills, hence its name. When the water returns the pills rupture and shed their spores into the water, thus restarting the population of what is basically a pioneer plant all over again.